After the course of general music education, the girls can continue to the training choir of the Roden Girl Choristers. Here the girls work on the development of musical imagination or conception and making music together as a group. In this second educational year, many English language music pieces are studied. Lessons, focusrgcsed on development of good singing technique, solfa or music theory and rhythm development are also continued. 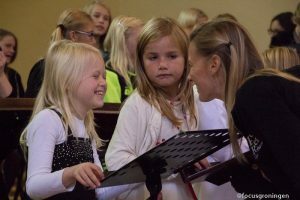 Continuing on from the training choir, talented girls can proceed to the concert Choir of the Roden Girl Choristers after a bridging period of three to five months. Girls in this concert choir are also offered the opportunity to receive solo performance lessons. Although not every girl will become a professional singer, learning how best to handle the unique instrument that is the voice is of great value.